The Dusky Eagle Owl is a fairly large owl with prominent ear-tufts. Typical call - Keoladeo National Park, Rajasthan, India. November 2007. CC Antero Lindholm. Description: The facial disc is whitish with dark shaft-streaks of feathers and a distinct, narrow and darker rim. The irises of the eyes are bright yellow. The cere and bill are bluish-lead in colour with a pale yellowish-horn tip. The prominent ear-tufts are a darker greyish-brown colour. The upperparts are brownish-grey with blackish shaft-streaks and dark brown and whitish vermiculations. The scapulars have whitish outer webs, finely vermiculated brown, forming an indistinct scapular row. The underparts are very pale buffish-grey with prominent, dark shaft-streaks and brown cross-bars. The primary and secondary flight feathers are barred light and darker greyish-brown. The tail is pale brownish-grey with white tips, and has 4-5 broad, dark greyish-brown bars. The tarsi are feathered to or beyond the base of the toes. The sparsely bristled tips of the toes are plumbeous-grey in colour with paler soles. Claws are blackish-brown. Size: Length 48-53cm. Wing length 380-435mm. Tail length 187-224mm. Weight (no current data available). Females are larger and heavier than males. 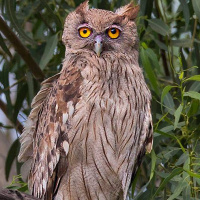 Habits: Although not completely nocturnal, the Dusky Eagle Owl usually spends the daytime in the seclusion of a shady bough or foliage, becoming active about an hour before sunset. They have been observed on the move and hunting in the day, especially cloudy days, but never during the brightest and hottest hours. They are usually found in pairs, and are very faithful to localities. These owls can be heard calling at all hours of the day, and are most vocal during the rainy and cold seasons. Voice: The song is a phrase of resonant, accelerating, croaking notes: kro kro kro-kro-krokrokoikoikokog, with the ending notes given in a rapid staccato sequence, resembling a tremolo. This phrase lasts about 3 seconds. Male and female may be heard duetting during courtship. 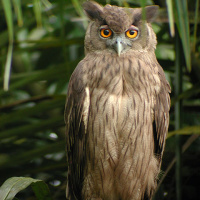 Hunting & Food: Dusky Eagle Owls feed on small mammals, birds, reptiles, frogs, fish, and large insects. Breeding: Breeding season overall spans from November to April. In Northern India, it is principally December to January, and later in the south. This owl uses abandoned stick nests of larger birds in the fork of a large tree, preferably standing in or near water. Normally two eggs are laid, sometimes only one. Eggs are white and roundish-oval in shape, averaging 59.3 x 48.2mm. They are laid several days apart, so chicks end up being very different in size. Usually, only the larger and stronger one survives. While both the male and female have been observed on the eggs, it is likely that the female does the incubation, and the male will briefly cover the eggs when the female leaves the nest for a short time. Incubation and fledging periods are unknown. Habitat: Well-wooded and well-watered country, never in arid or desert regions. 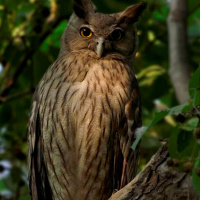 The Dusky Eagle Owl is also found in old mango plantations, and in other densely foliaged trees in proximity of water and habitation, normally on the plains. Occurs up to 250m above sea level. 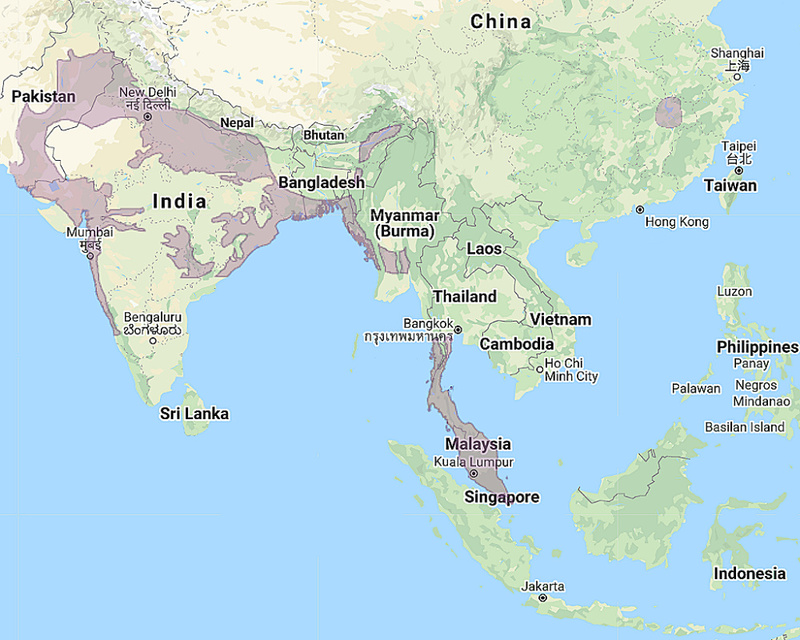 Distribution: Indian subcontinent, Nepal and Bangladesh, Burma and Malaysia. Also disjunctly in southeast China. Status: Not uncommon in India and Bangladesh in suitable habitats. Very rare in easternmost parts of range. Original Description: Latham, John. 1790. Index orntihologicus, sive Systema ornithologiae; complectens avium divisionem in classes, ordines, genera, species, ipsarumque varietates: adjectis synonymis, locis, descriptionibus, & c. (Index Orn.) 1: p. 53. 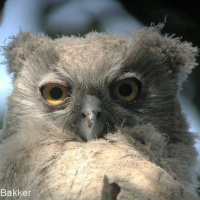 See also: Other owls from Asia, Genus: Bubo. Page by Deane Lewis. Last updated 2017-07-23.